Many people dream of being a star capturing everyone’s attention. They would go to all sorts of live TV competitions like British’s Got Talent, American Idol, The Voice, X-Factor, and all the alike. But have you ever imagined being born as a star? That everyone has their attention falls on you from the time you were conceived? And that your every moment is being watched by millions of people across the world? 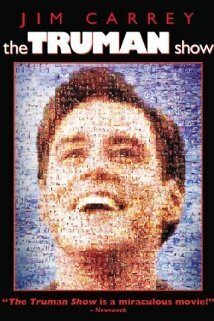 The other day by chance I came across an old movie called The Truman Show. At first I thought it was going to be a stupid movie as I am not a big fan of Jim Carrey because I think that his acting is often unnecessarily exaggerated and contrived, but having said that, the movie turned out to be unexpectedly excellent! Well…I don’t mean Jim Carrey is excellent, I think he is pretty much the same as he is in his other movies, but what I was amazed by was that the movie actually has quite a philosophical and meaningful story. I don’t want to spoil the movie by telling you everything happened in the movie, but here is a one-line summary copied from IMDB which gives you a minimal idea what the movie is about. Now, you got the idea. I felt connected to the movie. At some stages of my life, I also thought that life is like a movie. People have things happened in their life dramatically and unexpectedly from time to time. A few years ago, I drew this picture. The concept of this picture is similar to that of The Truman Show. Life is a movie. Everyone plays a particular role in this movie. Except that none of us is Truman. Perhaps there is more than one Truman. Perhaps we are all Truman. This entry was posted in Draw, Think, Watch. Bookmark the permalink.